This personal blog post is dedicated to an inspiring couple in Mumbai and to the editor who introduced us: May our tribe increase. 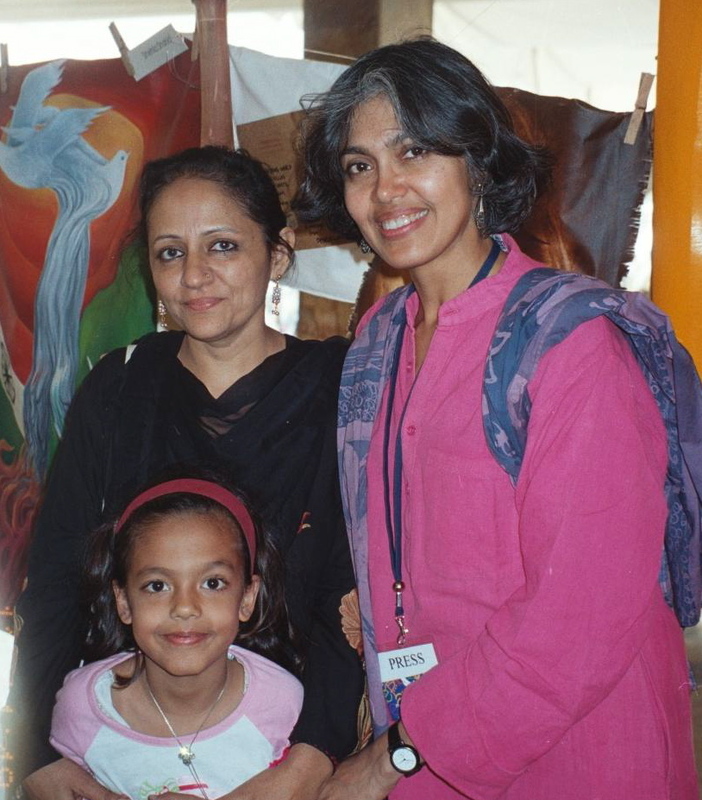 Enduring ties: Seema Sehgal at PIPFPD, Karachi, 2003, with me and my daughter Maha. Photo by Ved Bhasin. The petite and unassuming Mumbai-based ghazal singer from Jammu has none of the airs one might expect from a performer of her calibre. She is not only an amazing artist, but she also has a deep and abiding interest in Urdu poetry and in Indo-Pak peace. When relations plummeted between the two countries following the nuclear tests of May 1998, Seema dedicated her new album ‘Sarhad’ to peace between the India and Pakistan. Indian Prime Minister A. 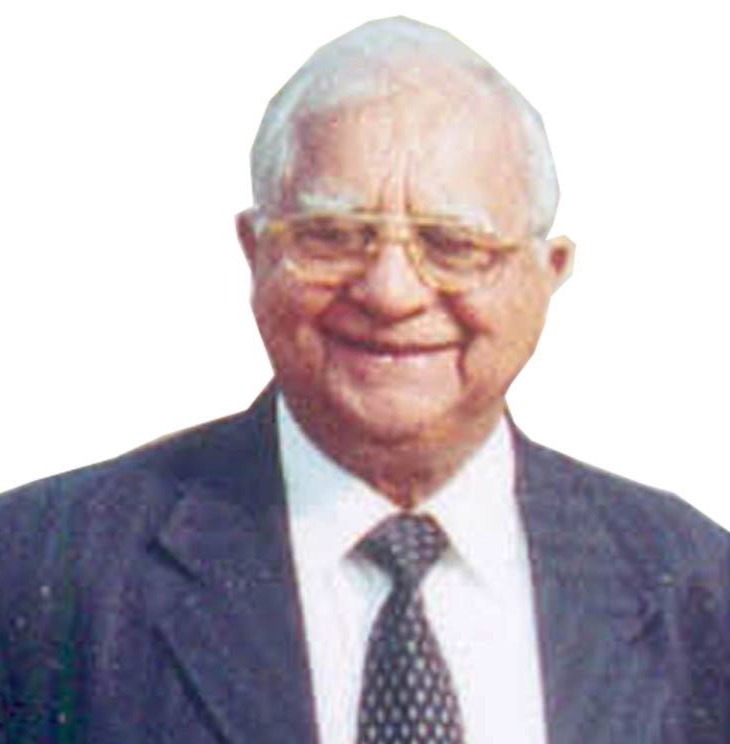 B. Vajpayee presented the album, a compilation of Seema Sehgal’s rendering of the poetry of Ali Sardar Jafri, as a national gift to Pakistani Prime Minister Nawaz Sharif at the historic Lahore summit of Feb 1999. Seema Sehgal is the only singer in India – or Pakistan for that matter – to have composed and sung an entire concert on the poetry of Allama Iqbal, ‘Sitaron se aage jahan aur bhi hain’ (2003), produced as the first solo album based on Iqbal’s poetry. 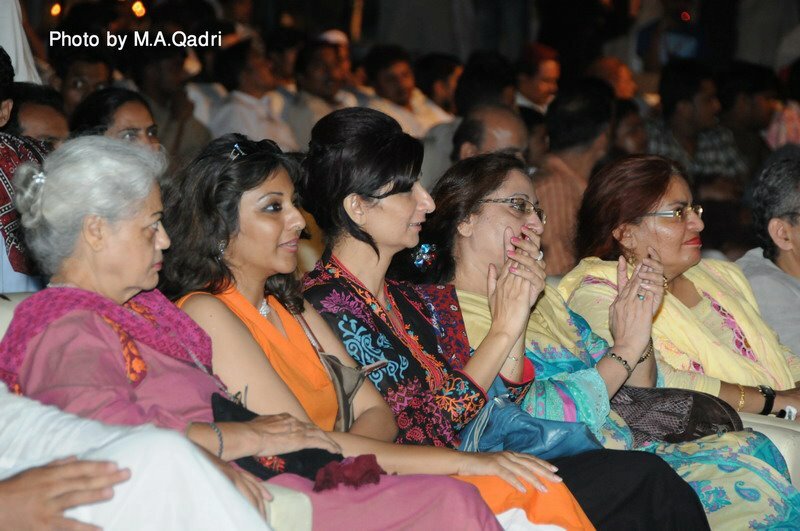 She has also composed and sung concerts of renowned Urdu poets Mir Taqi Mir (1986) and Faiz Ahmed Faiz (1988). Through email, I became acquainted with her husband Sqn Ldr Anil Sehgal. My initial wariness at communicating with a former Indian air force pilot quickly dissipated. Anil is as passionate about music and about peace with Pakistan as his wife. Over the years, I’ve helped them connect with friends in Pakistan for various cross-border projects. When I was looking for music for ‘Milne Do’, my documentary film on Kashmir, I saw Anil on chat and asked him to send me something of Seema’s Within seconds, I had the audio of Seema’s rendition of Ali Sardar Jafri’s marvelous ‘Guftugu Bund Na ho’. That I used for the soundtrack and it adds tremendously to the film. He wasn’t able to stay beyond the opening night, so I don’t yet have an update on Seema’s performance, one of the several cultural items at the three-day long event. A couple of months ago, Faiz Ahmed Faiz’s younger daughter Moneeza Hashmi emailed Seema and Anil explaining that an event scheduled for December that she had invited them to had to be postponed due to financial constraints. “We understand,” responded Anil. “But we wish you to understand that we have great respect for poetry of Faiz sahib, and for you and Salima Aapa (Faiz’s older daughter). Long live the spirit of the Bulbul-e-Kashmir and her retired Indian Air Force officer. Shukriya, Ved Bhasin sahib, for the introduction. Could you please let us have some links to the Bulbul-e-Kashmir’s songs? Faiz Ahmed Faiz was no ordinary poet. He hit you straight in the heart. Who can forget his poems strung like beads of love? I had the honour of meeting his daughter and Nayyara Noor at the launching of the CD commemorating Faiz, in Karachi. I remember about 80% of his poems by heart and felt so happy when both Nayyara and his daughter were so kind in their comments. We would love to hear how Ms. Seema has rendered Faiz Sahib. Just saw a video report on ‘Milne Do’. It is really good. Highly appreciated.